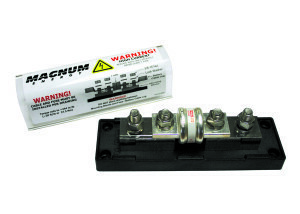 Modern RVs are heavily laden with electrical components. The latest Class A motorhomes can be equipped with multiple TVs, washer/dryers, air conditioners and electric fireplaces. Even the smallest travel trailer will have a television, microwave oven and other various 120V appliances. All of these require power to operate. This is not an issue when your RV is plugged into a campground pedestal but when campground power is not available you either need to find an alternate source of power or forget about using your AC devices. A generator can be used to provide power whenever campground power is not available. Motorized RVs generally have an on-board generator that can be operated while driving or dry camping. Everything is self-contained and can be operated simply by pressing the generator start switch. Most towable RVs require setting up a portable generator and plugging the RV’s power cord into the generator. This works for dry camping but doesn’t work when traveling, however most AC electrical needs aren’t needed when traveling unless you want to use the microwave at a rest stop. But there are times when it’s just not feasible to operate a generator. If all you want to do is watch a little TV or run the microwave you really don’t want to start up the large generator just for that. Some campgrounds also have quiet time restrictions that prohibit generator use during certain hours. To fill these needs an inverter is the best choice. An inverter is a device that utilizes 12V battery power to create 120V AC power through a process called inversion. It’s just the opposite of a converter, which converts 120V AC power to charge batteries or power your 12V electrical devices. Inverters are available in a wide range of sizes. Small inverters can be used to power a television and related components, such as a DVD player or satellite receiver, while larger inverter/charger units are available in sizes from 2,000W to 3,000W capable of providing power to a wide array of electrical devices and receptacles. 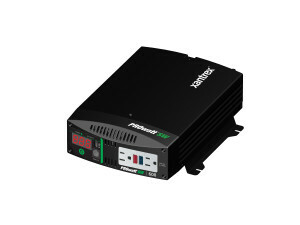 An inverter/charger also provides 12V battery charging power and eliminates the need for a converter. The larger units are generally fed to a breaker sub-panel while the smaller units can be connected directly to an outlet or two that the entertainment system is plugged into. Larger inverter/chargers often include the ability to equalize your battery bank to remove sulfation from the wet cell battery plates and restore them to full capacity. Electrical components are designed to run on a true sine wave. This is standard utility power that is present in your campground pedestal or from a generator set. Inverters do not have a rotating generator field so they use electronics to create this waveform. Early inverters used electronics to create a modified sine wave. This worked well for basic loads, such as toasters, lights and heating elements but today’s RVs are outfitted with increasingly more sophisticated electronics and many of these items don’t fare well on a modified sine wave. With recent advances in technology it’s now possible to get true sine wave inverters at an affordable price point. Electrical equipment is designed to operate on RMS voltage, which stands for Root Mean Square and is a true measurement of power. A true sine wave rises and falls on a curve, as shown in the accompanying figure. It briefly peaks at 170V then falls back down to zero in response to the rotating magnets within the generator. A modified sine wave inverter produces power by switching it on and off. This results in a square wave, as evidenced in the same illustration. The peak shoots right up to 145V, hangs there a while, then immediately drops to zero and rests for a bit before repeating the cycle. 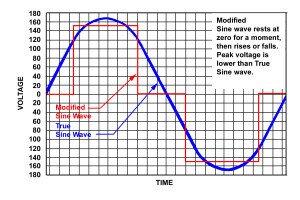 Modified sine wave power can damage certain electrical components, especially those with electronic circuitry. A true sine wave inverter still creates its waveform electronically but is designed to duplicate the curve of standard utility power and is safe for operation with any electrical equipment. There is no such thing as a free lunch when it comes to energy. As your power requirements increase, so does the need for a larger battery bank. If you have a 2,000W or larger inverter/charger and need to draw 10 amps of 120V power from it for one hour you’ll require 1,200W of power for that hour. This relates to 100 amp-hrs at 12V from your batteries, although inverters are not 100% efficient so you may need to add another 10% to this, depending on the inverter model. Battery banks should never be drawn down below 50% or else the batteries lifespan will be drastically shortened, therefore you’ll need a 220 amp-hr battery bank to power that load for one hour. After the hour is up your batteries will be depleted and you’ll need to recharge them. 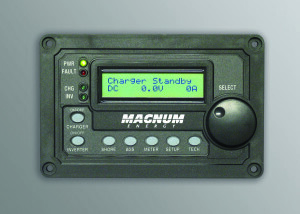 Generally motorhomes equipped with large inverter/chargers come with at least four batteries. The typical bank of four 6V golf cart style batteries will give you 440 amp-hrs at 12V. In order to prevent your batteries from draining below 50% you will want to keep the useable draw from that battery bank to 220 amp-hrs. Adding additional batteries will increase your potential runtime. For this reason inverters are typically used to power smaller loads or medium sized loads for short durations. A 3,000W inverter that only needs to pull 3,000W for a few minutes will put less of a strain on the batteries than a 2,000W inverter running at half capacity for an hour. Powering an entertainment system is a typical example of a low power consumption over a fairly lengthy time. Running a microwave oven is an example of a high power draw for a short duration. Heavy loads, such as air conditioners and water heaters, are not connected to an inverter because they will exhaust your battery supply in short order. The latest trend in Class A motorhomes is residential refrigerators. They really are not the power hog that you might think. They consume medium power but their efficiency is so good that the actual runtime is minimal. In fact a 22 cu ft residential refrigerator will actually consume less inverter amp-hrs than a 12 cu ft propane/electric model that is operating on AC power. While some RVs come equipped with inverters as either standard or optional equipment, not all do. However, it is possible to add an inverter to an existing RV or replace a modified sine wave inverter with a true sine wave inverter. A replacement inverter is generally a fairly easy swap. You simply remove the old inverter and replace it with the new model. The remote display panel that controls the inverter mu st also be replaced. In some cases the cable that connects the remote panel to the inverter may need to be replaced or have the ends terminated in a different pin configuration but that’s something your RV dealer, such as the Guaranty RV Travel Center, can help you with if you’re not sure how to do that. If you want to replace a smaller inverter with a larger unit, you’ll need to ensure that both the DC battery cables as well as the AC wiring are adequate to handle the increased load. When adding an inverter to an RV that previously was not equipped with one, you’ll need to do a bit more planning. Ideally, the inverter should be located as close to the batteries as possible to minimize voltage loss due to excessive cable length. However you cannot place it in the same vented compartment as the batteries due to the explosive battery gasses present. The inverter’s location also needs to have adequate airflow to prevent the inverter from overheating. The size of the battery bank determines how long your inverter will run. If your existing battery bank isn’t adequate to operate your intended load you may have to upgrade or add additional batteries. 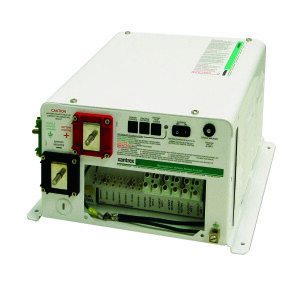 Large inverters may have a pair of circuit breakers with hard-wired output circuits to connect to specific circuits in the motorhome but the majority of the large inverter/chargers generally are hard wired. You’ll need to supply an AC input feed from one or two breakers in the main breaker panel and then send the inverter’s output to a sub-panel where additional breakers feed the various circuits in the motorhome. Again, if this is an area that you are unsure of, it’s best to leave the installation to the professionals. In some cases you only need a small inverter to run a television and DVD player or satellite receiver. In that case the inverter can be placed close to the television and switched on when needed. Depending on the inverter you may need to unplug your TV and replug it into the inverter or you may have a pass-through power connection where you can leave it plugged in 24/7 and just use pass-through power when available. To use the inverter you just push the power button to operate it. This makes the DC wiring requirement much smaller. In many cases a 450W inverter can get by with a #8 or #6 wire, depending upon the length of the wiring run. These units are fairly inexpensive but they are generally not as efficient as the larger inverters and may be modified sine wave rather than true sine wave. They also provide no battery charging ability so you’ll need to keep your existing converter but they are a cost effective way to power a small electrical device. An RV has much to gain from an inverter. An inverter can provide instant power to operate the various electrical devices in the coach. No longer do you have to start the generator to make a cup of coffee, watch a TV show or run a hairdryer. Whether boondocking or driving down the road, the power is instantly there. It is user friendly, produces no emissions, and is quiet. Adding an inverter to your RV will be a worthwhile investment.